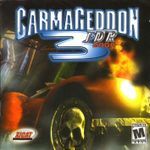 Carmageddon: Total Destruction Racing 2000, more commonly known as Carmageddon TDR 2000 (or Carmageddon 3: TDR 2000 in North America), is an action-racing-vehicular combat video game. The sequel to Carmageddon II: Carpocalypse Now, it was developed by Torus Games and released in the United Kingdom on September 1, 2000, and on December 14 in North America. The title is a homage to an inspiration for the Carmageddon series, Death Race 2000. As with the other games in the series, one of the most controversial aspects was that pedestrians could be killed by immolation (being set on fire) or graphic collisions that could include dismemberment. Versions of the game in some countries replaced the human pedestrians with zombies (actually only changing the red blood to green slime), but patches were circulated on the internet that reverted the game to its original state. Source: Wikipedia, "Carmageddon TDR 2000", available under the CC-BY-SA License.